The sixth step of AA is all about being entirely ready to live your life in a new way. As a guy who relapsed with heroin many times, I can appreciate how important it is to tackle this step, to embrace the spiritual principal of “willingness.” Sometimes the hardest part of recovery isn’t the initial burst of right action to achieve abstinence, but the following slog through the myriad of day-to-day decisions that makes your recovery a reality. In this chapter, being willing meant finding a way to bridge the tension between the path I had chosen for myself in recovery, and the forces that were in constant competition with my progress on that path. By far, the most powerful powers pitted against me came from inside my own head: my insecurities about school, and doubts about my ability to be a good parent and a decent person. I mean, sure, various people would appear in my life and provoke these doubts or insecurities. I know my son’s mother really wanted me to find a way to earn more money. I don’t blame her. Although I was providing the amount the courts had recommended, it was really a pittance. Some of my high school friends felt that I shouldn’t have left Steelton to live in New York City. I know they didn’t understand the whole story, but even if they had, it wouldn’t have really mattered, because recovery isn’t about what other people think. Recovery is about making the best of a bad situation. If some of my high school friends judged me because I left Steelton, I had to be willing to recognize that some of my friends who were still using drugs were astonished and buoyed by my progress. If my son’s mother felt I ought to pay more child support, I had to be willing to sit down with her and discuss what I was trying to do, and still find meaningful ways to contribute, even if those contributions weren’t always what she had in mind. I found myself in a complicated situation that was difficult for me to explain. I wanted my son’s mother to understand that by going to college instead of working full time, I was staking my future earning potential. But I’d hatched so many harebrained schemes during our short marriage, even I wasn’t quite sure it would work. I don’t know how well I conveyed it in this chapter, but I agonized over the decisions that kept me in school, making progress towards a degree. I wanted people to like me, to understand what I was trying to achieve with my life. I wanted people to know that I wasn’t trying to dodge responsibility. And this is probably why I took such comfort in literature. It made me feel less alone. I found characters with equally complex challenges. I was especially lucky to have good teachers, like Alice Sebold (author of THE LOVELY BONES), who shared frankly with me about her own experience with heroin. If you just surround yourself with people from AA, you can find yourself wondering—as I often did—if we were all deluding ourselves about what it means to be in recovery. Alice brought a much-needed outside perspective to my recovery. 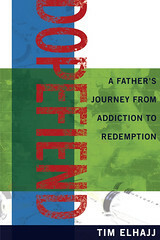 And if you’ve read DOPEFIEND, you know that an outsider who brings a much-needed perspective to bear foreshadows a watershed moment between my son and me at the end of the book. Sometimes you just have to be willing to look at things in a new way to recognize the new life that you’re trying to establish. Discuss the differences between willingness and willfulness. If “recovery isn’t about what other people think,” then how can anyone in recovery be sure they’re on a productive path? In this chapter, the DOPEFIEND continues to attend school, believing it’s the direction his Higher Power wants him to follow. How can he know this? How is this not willful behavior? If recovery is about “making the best of a bad situation,” how can a recovering addict trust his own judgment, especially if his best judgment has landed him in hot water in the past. In this chapter, the DOPEFIEND offers guidance to his ex-wife and her husband about how they can have the child support payments increased, even though an increase might surely sink the DOPEFIEND’s plans to complete school. Is this making the tension around money better? Worse? If you’ve relied on your shortcomings as assets during addiction, how do you learn how to trust yourself, and make good decisions, without your shortcomings? Whatever answer you come up with, how does it tie into the themes of willingness and willfulness? In this chapter, the DOPEFIEND finds solace in writing and literature, as well as the advice of former drug abusers who aren’t participating in twelve step programs. What are the benefits of incorporating outside perspectives into one’s own recovery? What are the challenges?